The MAHARRIS GROUP provides equipment through its national providers. All equipment is leased with full-service agreements on call 24/7, allowing us more time to focus on you the customer. Capacity and Ottawa Yard Trucks are utilized at all locations. All units come equipped with hydraulically activated fifth wheels in single and tandem axle configurations. Units are available in both on (licensed to operate on public roads) and off-highway use (private property). On-highway trucks are equipped with the necessary equipment to meet DOT/EPA requirements. A back-up unit is provided at each customer location to ensure a “No-Noise” operation. What is a Yard Truck? A Yard Truck is a specialty vehicle designed to move and spot trailers or containers in various applications. They may include warehousing, manufacturing plants, distribution centers, freight yards, cross docks, ports and intermodal ramps. 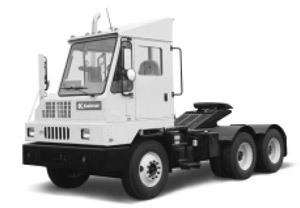 Yard Trucks are known by several names: Terminal Tractor, Trailer Jockey, Yard Mule, Yard Dog, Yard Truck, Yard Spotter, Yard Jockey, Yard Hostler, Yard Horse, Shuttle Spotter, Yard Goat, Stevedoring Tractor, Ro-Ro Truck, Ottawa or Capacity Truck.